Usually when I travel I find some excuse for a beer-blog post along the way. Our family vacation to Jamaica earlier this month was an exception. In the places we were, the only beers I saw were Red Stripe, Guinness, and Dragon Stout. For the final three days of our trip, we were imprisoned at a cheap beach resort and the only beer choice was Red Stripe. But during the week we spent roaming the country before that, local Dragon Stout was my occasional beer of choice. Dragon -- from the same company as Red Stripe -- seemed like a decent stout, not unlike Guinness, so I brought a few bottles home for further study. Wasn't Dragon Stout available in the US in the pre-microbrew days? I'm pretty sure I remember being able to get it in Austin in the mid- to late-eighties. 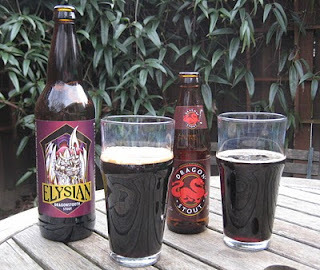 Today when I was at Beermongers looking for a stout to compare Dragon against, I noticed a bottle of the lovely Dragonstooth Stout from Seattle's Elysian Brewing. Suddenly the world started spinning, and in an attack of deja vu, I found myself back in 1986 standing in front of the beer cooler at Wheatsville Food Co-op in Austin. I want a nice big beer tonight -- I can't afford the $6 for a 750 of Chimay, so should I get a Steinlager, a Dragon Stout, or a Tooth's Sheaf Stout? Something dark... Dragon? Tooth? Dragon? Tooth? Dragonstooth? Did Elysian name Dragonstooth after that pair of international stouts? Whatever the case, I didn't need a flashback to convince me to pick up a bottle of Dragonstooth. It's good stuff. 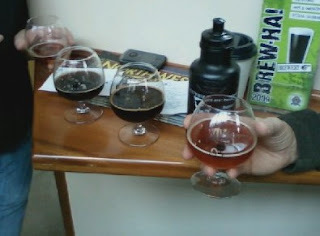 (And speaking of Tooth's, last year Jeff Alworth "rediscovered" Sheaf Stout, much to his delight). Now let's compare Dragon and Dragonstooth. As you can see from the picture above, the Dragonstooth is pitch black; the Dragon is dark but reddish when the light shines through. 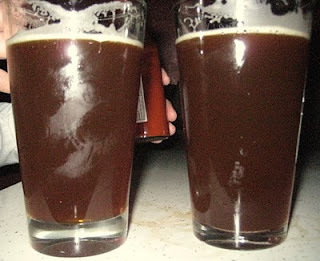 They both weight in with nearly the same strength, 7.5% for the Jamaican vs. 7.45% for the Washingtonian. Let's see which is the champion . Dragon Stout: very sweet, like Malta or cola, moderately thin mouthfeel, but lots of syrupy legs on the glass, little hops. As it warms, a little of stouty roastiness and a hint of molasses come in to join the original cola flavor. Dragonstooth Stout: roasty almost charcoaly aroma, creamy mouthfeel, delicious toasted-grain flavor with a nice bitter wallop that lingers on the tongue. Also very leggy, but not nearly as sweet (a good thing). Really there's no contest. Dragonstooth is a much more flavorful and polished beer than Dragon, which is too cloyingly sweet. But to give Dragon some credit, I later popped open a Guinness Extra Stout and found it much closer in flavor to the Dragon Stout than to Elysian's beer, though not nearly as sweet. And of course, if you find yourself on a tropical vacation where your drink choices are Red Stripe, rum punch, or vitamin-enhanced wine, Dragon Stout sounds just fine. By the way, we had an excellent time on our vacation. 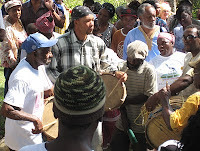 We timed it to attend the annual Maroon Celebration in the town of Accompong in the interior of Jamaica. The Maroons were a group of escaped slaves that waged an 80-year insurgency against the British colonial powers, until the British relented and signed a treaty granting them self-rule in 1739 (the rest of Jamaica belonged to Britain until 1962). They celebrate the occasion of the treaty in Accompong every year on January 6th. This year's was the 272nd annual celebration -- the Maroons have been independent from England for longer than we have. It's a fascinating bit of living history, and also a great party. During the fall I became infatuated with Beulahland, the "Coffee and Alehouse" at 28th and Couch. I biked my daughter to soccer practice Thursdays at DaVinci Middle School, and noticed that I could take refuge at the happy hour just down the street. On my first visit I was impressed by the beer choices -- one of the ten taps was a Lompoc fresh-hop ale, and the place even had a nitro tap and a cask engine. They also have about a dozen house-infused vodkas and bourbons; I've yet to try any of them, but they have some interesting-sounding flavors like habanero whiskey and watermelon vodka. 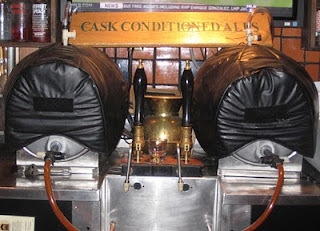 Strike one: The cask engine is gone. Strike two: The chalkboard and bartender both concealed the best beer tap from me. Strike three: My beer was served in a cheater pint glass! It wasn't until our second round that we noticed the telltale Terminal Gravity tap handle and found out that the delicious TG Festivale was on tap. It wasn't on the chalkboard, and the bartender didn't bother to point it out to a crowd of obvious beer geeks. That's the kind of action I expect from Henry's, not from the divey local. Those first two strikes are no big deal. But cheater pints? Now you're adding injury to insult. Check out the picture above, and you'll see the giant boot in the bottom of the glass of Festivale on the left. That's as thick as the glasses I wore in fifth grade! I'm glad that the Honest Pint Project is starting to move the finer pubs to use glassware with fill lines on them. Cheater pints are a fraud that must be stopped. On the plus side, the city has installed one of the new bike-parking corrals on 28th right by Beulahland, so there's plenty of two-wheeled parking. And the jukebox has a brilliant variety: Black Sabbath's first album, Duke Ellington's Money Jungle , and -- stroke of genius -- Hasil Adkins . 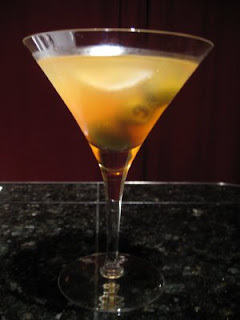 I still enjoy the atmosphere at Beulahland, and I would like to check out those infused boozes. This last visit cooled my ardor somewhat, but I still consider it a little-known gem in that area. Ezra is so plugged in to the Portland beer scene, that the New School is going to be a must-read blog for getting the latest information. I'll go ahead and take credit for the birth of that blog: I've been encouraging Ezra to start a blog for about the last year and a half. At first I think he worried that it would conflict with his job at Belmont Station; now that he's moved on from there I guess he feels more free to express himself. So far he's been cranking out close to one post a day -- I hope he doesn't burn out, because he turns up lots of good material. Speaking of burning out, Dave Selden is going to write about one beer a day until September 26, 2012. Haven't you heard of the kid in the candy shop, Dave? I hope he can pull it off, although it would have made much more sense to wrap up the project at the end of the Mayan calendar on the 2012 winter solstice . I'm usually skeptical about beer-a-day projects like this, but I like it that it highlights Dave's low-tech beer app 33 Beers. I was beginning to wonder if Facebook and Twitter had killed blogging, but it looks like it's alive and well. There must be about a dozen good Portland beer blogs that I follow now. At last year's OBF, I was having a friendly conversation with a stranger who sat near me to eat his lunch. As I do with everyone, I asked him what he liked so far. He said, "I loved that Red Hook Tripel. It was like Double Blue Moon!" Pretty funny thing for a beer geek to hear, but hopefully it means one guy will step up from Coors to Red Hook, and maybe keep going up the ladder. 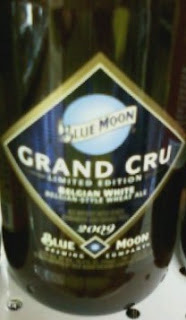 Ironically, Coors has now brewed a stronger version of Blue Moon, the -- let me compose my straight face -- Blue Moon Grand Cru. I was trying to work up the courage to buy a bottle of this from Belmont Station, but at $11 for 750 ml -- SPE $31.23 -- all I could do was take a picture of the bottle on the shelf. I'm proud to say that, despite growing up in Oklahoma, my lifetime expenditure on Coors beer is less than $11. There's no way I'm going to triple or quadruple it in one shot. The Beer Advocate consensus is B-. Have any of you tried BMGC? I'm on vacation right now, far from the gray skies of Portland. To fill the space, here are some reruns -- posts that have aged for over a year. In other words, they were written when only a handful of people read It's Pub Night. Now that readership has risen to two handsful, I'd like to reintroduce some of the early posts that I'm happiest with. I hope you like them. February 2008: Incidental Contents Are Not Intended for Consumption: I auctioned my empty Abyss bottle on Ebay. 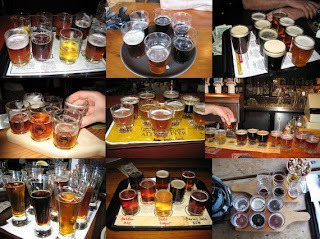 June 2008: Portland Sample Tray Marathon: Dave and I sample 78 beers brewed on premises in 6 hours. 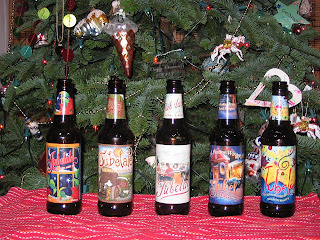 December 2007: Jubel Vertical Tasting, 2007: The first year that I had five years of Deschutes Jubelale in the basement. 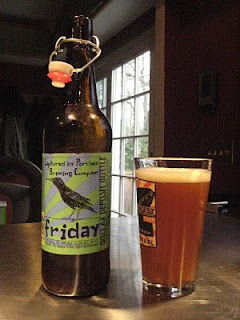 October 2008: Beer Martini: Put your stale growler remnants to good use.